Harrison Sylvanous "Harry" Armstrong was born September 1, 1869, in Baraboo, Sauk Co., WI, and died April 25, 1963, in Ladysmith, Rusk Co., WI, at age 94. Buried in Riverside Cemetery, Ladysmith, Rusk Co., WI. He is the son of Samuel Bolton Armstrong of Edwardsburgh, Canada West (Ontario), and Delilah Matilda Jones of New York. Florence Viola Abbey was born about January 20, 1882, in Wausau, Marathon Co., WI, and died April 14, 1961, in Ladysmith, Rusk Co., WI, at age 79. Buried in Riverside Cemetery, Ladysmith, Rusk Co., WI. She is the daughter of Isaac Abbey of Hope Twp., Durham Co., Canada West, and Mary Allen of Fond du Lac, Fond du Lac Co., WI. 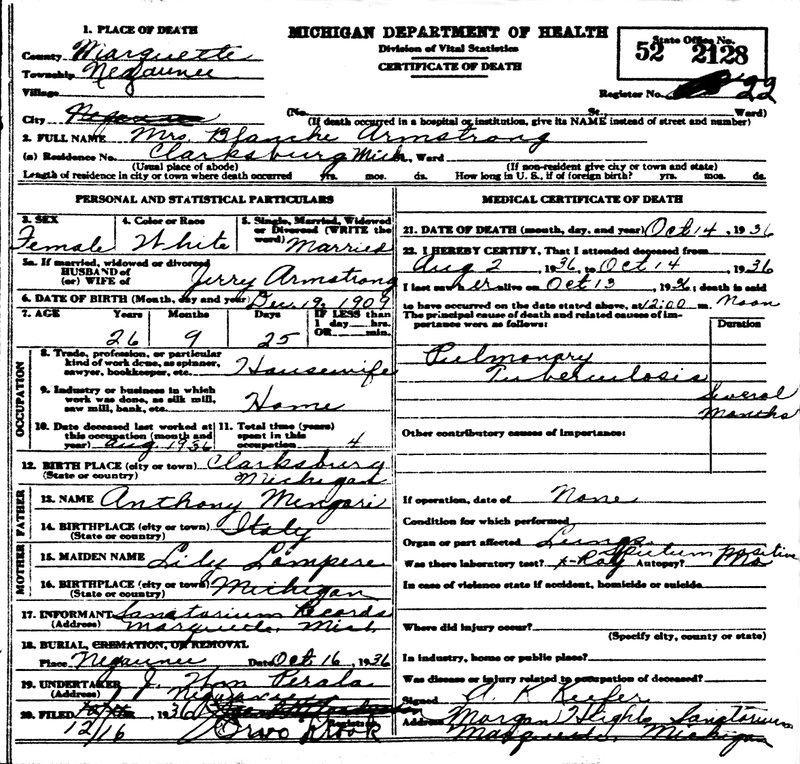 Harrison Sylvanous "Harry" Armstrong and Florence Viola Abbey were married March 6, 1902, in Milladore, Wood Co., WI. Harry was living in Sherry Twp. and Florence was living in Milladore Twp. Sylvanous C. Armstrong: Born May 22, 1903, in the Village of Fall Lake, Morse Twp., St. Louis Co., MN; Died February 13, 1974, at 314-1/2 East 10th Street, Amarillo, Potter Co., TX (age 70). Buried in Llano Cemetery, Amarillo, Randall Co., TX. Married (1) January 10, 1933, in Negaunee, Marquette Co., MI, to Blanche Alma Mingori: Born December 19, 1909, in Clarksburg, Ely Twp., Marquette Co., MI; Died October 14, 1936, at Morgan Heights Sanatorium, Negaunee Twp., Marquette Co., MI (age 26, due to TB). Buried in Negaunee, Marquette Co., MI. Blanche is the daughter of Anthony "Anton" Mingori of Italy, and Lillian "Lily" Lompry/Lampere of Michigan. Married (2) after 1936 to Unknown: Born Unknown; Died Unknown. Divorced before 1974 in Unknown. Hazel Florence Armstrong: Born January 30, 1909, in Superior, Douglas Co., WI; Died November 5, 1992, in Ladysmith, Rusk Co., WI (age 81). Buried in Riverside Cemetery, Ladysmith, Rusk Co., WI. Married (1) April 4, 1929, in Marquette, Marquette Co., MI, to Henry V. Setter: Born August 20, 1903, in Forsyth Twp., Marquette Co., MI; Died July 14, 1971, in Ladysmith, Rusk Co., WI (age 67). Buried in Riverside Cemetery, Ladysmith, Rusk Co., WI. Married (2) November 19, 1977, in Ladysmith, Rusk Co., WI, to Harry Eugene Burns: Born January 10, 1905, in Plover Twp., Marathon Co., WI; Died January 3, 1980, in Ladysmith, Rusk Co., WI (age 74). Buried in Riverside Cemetery, Ladysmith, Rusk Co., WI. 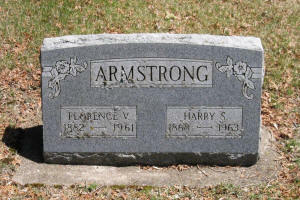 Male Armstrong: Born about 1910; Died Unknown. Harrison Sylvanous "Harry" Armstrong and Florence Viola (Abbey) Armstrong are buried in Riverside Cemetery, Ladysmith, Rusk Co., WI. Thanks to Find-A-Grave for making this image available. 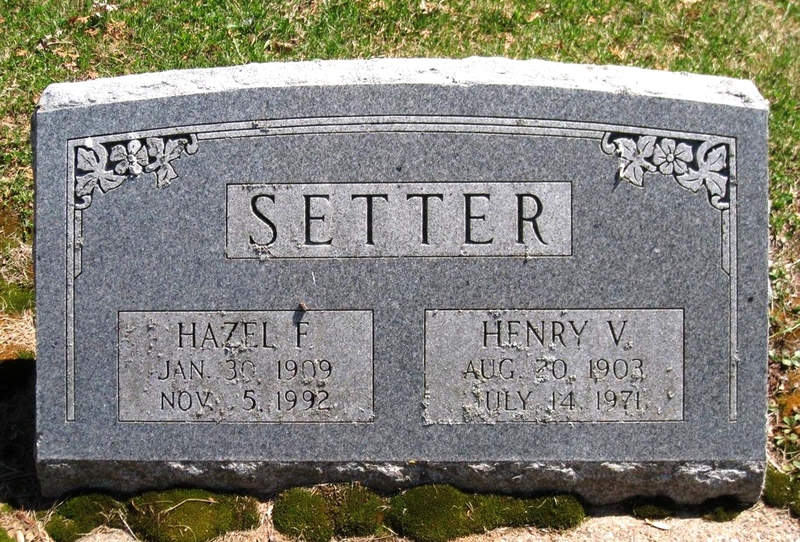 Henry V. Setter and Hazel Florence (Armstrong) (Setter) Burns are buried in Riverside Cemetery, Ladysmith, Rusk Co., WI. Thanks to Find-A-Grave for making this image available. Harrison Sylvanous "Harry" Armstrong was born September 1, 1869, in Baraboo, Sauk Co., WI. The 1870 U. S. Census taken on July 20, 1870 shows Samuel Armstrong (age 47) born in Canada is a Wood Farmer living in Baraboo, Sauk Co., WI. Living with him are his daughters: Cora Armstrong (age 4) and Clarissa Armstrong (age 2), both born in Wisconsin. Also living there as head of household and the home owner is his brother-in-law and his sister: Luther Griswold (age 41) born in New York who is a farmer owing real estate worth $3,000 and personal property worth $600; Clarissa Griswold (age 33) born in New York; and their children, all born in Wisconsin: Josephine Griswold (age 11); Ethlion Griswold (age 10); Laura Griswold (age 8); and Stephen Griswold (age 3). Also living there is an unrelated home laborer, Mary Houghton (age 18), born in New York. A few houses away live Dellia Armstrong (age 29) born in New York; and Mary Armstrong (age 7) born in Wisconsin. The 1880 U. S. Census taken on June 3, 1880 shows Samuel Armstrong (age 57) born in Canada to New York-born parents is a Farmer with a liver-related health problem is living in Rudolph Twp., Wood Co., WI. Living with him is his wife Lois Armstrong (age 49) born in Michigan to Ohio and New York-born parents. Also living there are Samuel's step-daughter and step-son, both born in Wisconsin to New York and Michigan-born parents: Floy Wiser (age 12); and Fred Wiser (age 10). Also living at home are Samuel's daughter and three sons, all born in Wisconsin to New York-born parents: Cora Armstrong (age 13); Harry Armstrong (age 11); Ira Armstrong (age 9); and Richard Armstrong (age 31) who is a Farmer. Florence Viola Abbey was born January 20, 1882, in Wausau, Marathon Co., WI. The 1900 U. S. Census taken on June 1, 1900 shows Charles Shorey (age 25) born May 1875 in Wisconsin to Wisconsin-born parents is a day laborer living in Milladore Twp., Wood Co., WI. Living with him is his wife of one year, Neta Shorey (age 20) born June 1879 in Wisconsin to French and Canadian-born parents, with the one child still living, born in Wisconsin: Adam G. Shorey (age 1) born April 1900. Neta's niece, Viola Abbey (age 18) born January 1882 in Wisconsin to Canadian and Wisconsin-born parents is a visitor. Within two years Viola would be married to a neighbor, Harrison Armstrong. The 1900 U. S. Census taken on June 7, 1900, shows E. O. Setter (age 51) born November 1848 in Norway to Norwegian-born parents and having emigrated in 1880 and a Naturalized citizen and is a Farmer owning his farm free of a mortgage and is living in Forsyth Twp., Marquette Co., MI. Living with him is his wife of 21 years, Paulina Setter (age 42) born February 1858 in Norway to Norwegian-born parents, with all 4 of the children born to her still alive. Also living there are his three unmarried children, both born in Michigan to Norwegian-born parents: Olaf H. Setter (age 17) born November 1882, a Farm Laborer; Elvina Setter (age 5) born January 1895; and Robert W. Setter (age 3) born January 1897. The 1905 Minnesota State Census taken on June 5, 1905 shows Henry Armstrong (age 36) born in Wisconsin to Wisconsin-born parents, and having lived in Minnesota for 15 years, and having lived in this district for 3 years, is a Machinist Laborer, and is living on River Street, Village of Fall Lake, Morse Twp., St. Louis Co., MN. Living with him are: Mrs. Henry Armstrong (age 23) born in Wisconsin to Canadian and Wisconsin-born parents, and having lived in Minnesota for 3 years, and having lived in this district for 3 years; and a male, Sylvanous Armstrong (age 2) born in Minnesota to Wisconsin-born parents, and having lived in Minnesota for 2 years, and having lived in this district for 2 years. The first inhabitants of present Winton were the native Americans of the Bois Forts Band of Chippewa. Lumbermen arrived in 1893 when Sam Knox started a mill on the south shore of Fall Lake. R. V. Whiteside and Billy Winton were partners in the operation, which was sold in 1899 and became known as the St. Croix Lumber Company. In 1898 the Swallow & Hopkins Lumber Company was formed. Soon a community was established with a schoolhouse built for the 18 students in 1894. In 1898 Robert and Sophia Whiteside recorded a plat of land immediately south of the Knox Mill location to form the Village of Fall Lake. Streets and alleys were mapped in 1899 and in 1903 the Village was officially organized. The area was commonly known as Winton, after Billy Winton, one of the original partners in the Knox Mill, and the name was officially changed in 1914, with a population of 2000. At the time of the lumber boom there were hotels, stores, saloons, boarding houses, a blacksmith and livery stable, community hall, post office, school, and hospital. In 1901, the Community Church was built as a Methodist outreach. The Duluth, Mesabi & Northern Railway provided passenger and freight service. As the lumber mills closed, the population declined and many buildings and the railway system were removed. In 1968 the City of Winton annexed the St. Croix location, home of the lumber mills. The 1910 U. S. Census taken on May 2, 1910, shows Harry S. Armstrong (age 40) born in Wisconsin to English Canadian and New York-born parents, and in his first marriage, is a Janitor at a House, and who rents his home, and is living at 2109 Tower Avenue, 7th Ward, Superior, Douglas Co., WI. Living with him are: his wife of 8 years, V. Florence Armstrong (age 28) born in Wisconsin to English Canadian and Wisconsin-born parents, and in her first marriage, and with both of the children born to her still alive; his son, Sylvanious Armstrong (age 6) born in Minnesota to Wisconsin-born parents; and his daughter, Hazel Armstrong (age 1-3/12) born in Wisconsin to Wisconsin-born parents. The 1910 U. S. Census taken on April 15, 1910, shows E. O. Setter (age 61) born in Norway to Norwegian-born parents and having emigrated in 1880 and a Naturalized citizen and is a General Farm Farmer owning his farm free of a mortgage and is living in Forsyth Twp., Marquette Co., MI. Living with him is his wife of 31 years, Paulina Setter (age 52) born in Norway to Norwegian-born parents and having emigrated in 1881, with 4 of the 5 children born to her still alive. Also living there are his two sons, both born in Michigan to Norwegian-born parents: Robert Setter (age 13); and Henery Setter (age 6). 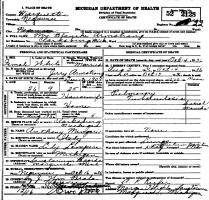 The 1920 U. S. Census taken on January 5, 1920, shows Harry S. Armstrong (age 49) born in Wisconsin to United States-born parents, is a married Watchman at a Shipyard, and who who rents his home, and is living at 618 Hammond Avenue, 3rd Ward, Superior, Douglas Co., WI. Living with him are: his wife, Florence Armstrong (age 37) born in Wisconsin to Canadian and Wisconsin-born parents; his son, Sylvenus Armstrong (age 16) born in Minnesota to Wisconsin-born parents; his daughter, Hazel Armstrong (age 10) born in Wisconsin to Wisconsin-born parents; and his unmarried brother-in-law, William Abbey (age 39) born in Wisconsin to Canadian and Wisconsin-born parents, a Teamster at a Wholesale House. The 1920 U. S. Census taken on February 20, 1920, shows Einar O. Setter (age 72) born in Norway to Norwegian-born parents and a Naturalized citizen is a Farmer owning his farm and is living in Forsyth Twp., Marquette Co., MI. Living with him is his wife, Paulina Setter (age 62) born in Norway to Norwegian-born parents and a Naturalized citizen. Also living there is his son: Henry W. Setter (age 17) born in Michigan to Norwegian-born parents, a Farm Laborer. In 1920, Sylvenous Armstrong (age 16) born in Minnesota, is an Inmate at the Preston School of Industry, Amador Co., CA. In 1925, Harry S. Armstrong is a Laborer for Peppard & Fulton, and is living at 2812 Elmira Avenue, City of Superior, Douglas Co., WI. Also residing there is Sylvanus Armstrong, a Laborer. The Preston School of Industry, also known as Preston Castle, was formerly one of the oldest and best-known reform schools in the United States. It is located in Ione, California, in Amador County. After construction was finished in 1890, the institution was opened in June 1894 when seven wards (minors under the guardianship of the state, but not necessarily juvenile offenders), were transferred there from San Quentin State Prison. The original building, known colloquially as "Preston Castle" (or simply "The Castle"), is the most significant example of Romanesque Revival architecture in the Mother Lode. It was vacated in 1960, shortly after new buildings had been constructed to replace it. The abandoned building has since been named a California Historical Landmark and is listed on the National Register of Historic Places. In 1999, the institution's official name was changed to the "Preston Youth Correctional Facility". The California Department of Corrections and Rehabilitation announced on October 21, 2010, that the Preston Youth Correctional Facility was to close, and a closing ceremony was held on June 2, 2011. 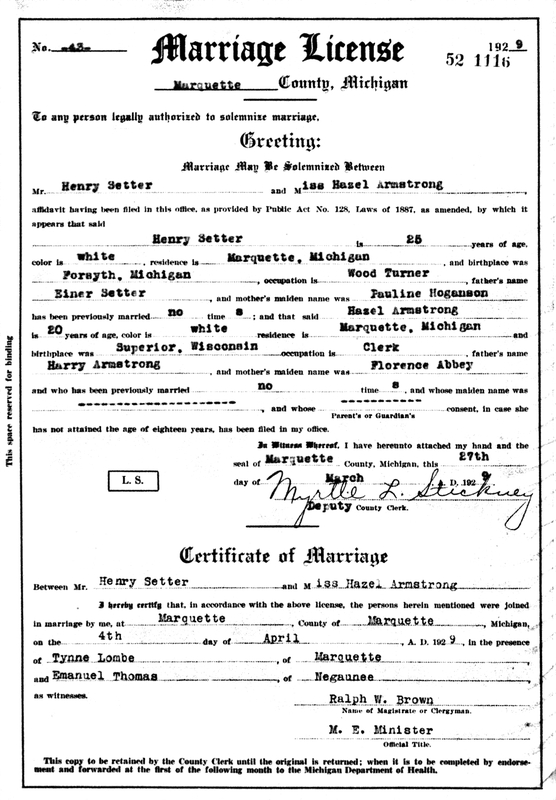 Henry V. Setter and Hazel Florence Armstrong were married April 4, 1929, in Marquette, Marquette Co., MI. Henry V. Setter and Hazel Florence Armstrong Marriage Record. The 1930 U. S. Census taken on April 10, 1930, shows Harry Armstrong (age 61) born in Wisconsin to Canadian and Wisconsin-born parents and first married at age 33 is a Laborer in a Handle Factory who is renting his home for $22 per month and is living at 350 Washington Street, 4th Ward, Marquette, Marquette Twp., Marquette Co., MI. Living with him is his wife, Florence Armstrong (age 48) born in Wisconsin to Canadian and Wisconsin parents and first married at age 20. 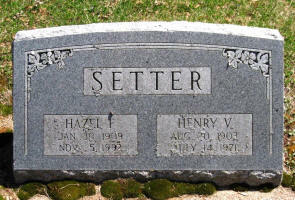 Hazel (Armstrong) Setter and husband also rent in the same building. The 1930 U. S. Census taken on April 10, 1930 shows Henry Setter (age 26) born in Michigan to Norwegian-born parents and first married at age 25 is a Wood Turner in a Handle Factory renting his home for $20 per month and is living at 350 Washington Street, 4th Ward, Marquette, Marquette Twp., Marquette Co., MI. Living with him is his wife, Hazel Setter (age 21) born in Wisconsin to Wisconsin-born parents and first married at age 20. The 1930 U. S. Census taken on April 14, 1930, shows Jerry Armstrong (age 26) born in Michigan to Michigan-born parents, is an unmarried Traveling Salesman of Portraits, and is Boarding at the George O'Connor residence, 612 Main Street, 1st Ward, City of Shawano, Shawano Co., WI. Iron Mountain, Mich. - Jerry Armstrong, of Marquette, connected with a picture canvassing crew now in the district, paid a fine and costs of $37.50 in municipal court this morning after pleading guilty to stealing a watch at a house in Norway that he visited yesterday. Armstrong was arrested late last night by Undersheriff Ed Corey after a lengthy search that finally led the officer to the Marvel hotel, in Kingsford Heights, where the picture crew was staying. At first the prisoner denied all knowledge of the theft, but when Corey searched his person he found the watch, valued at $35, which carried the initials of the owner. The salesman spent the night in the county jail. 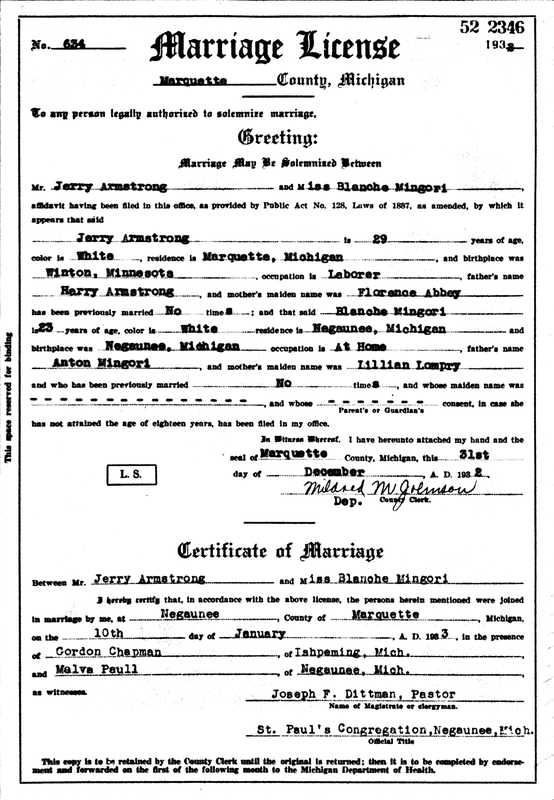 Sylvanous C. "Jerry" Armstrong and Blanche Alma Mingori were married January 10, 1933, in Negaunee, Marquette Co., MI. Sylvanous C. "Jerry" Armstrong and Blanche Alma Mingori Marriage Record. Blanche Alma (Mingori) Armstrong died October 14, 1936, at Morgan Heights Sanatarium, Negaunee Twp., Marquette Co., MI, at age 26, due to TB. Buried in in Negaunee, Marquette Co., MI. 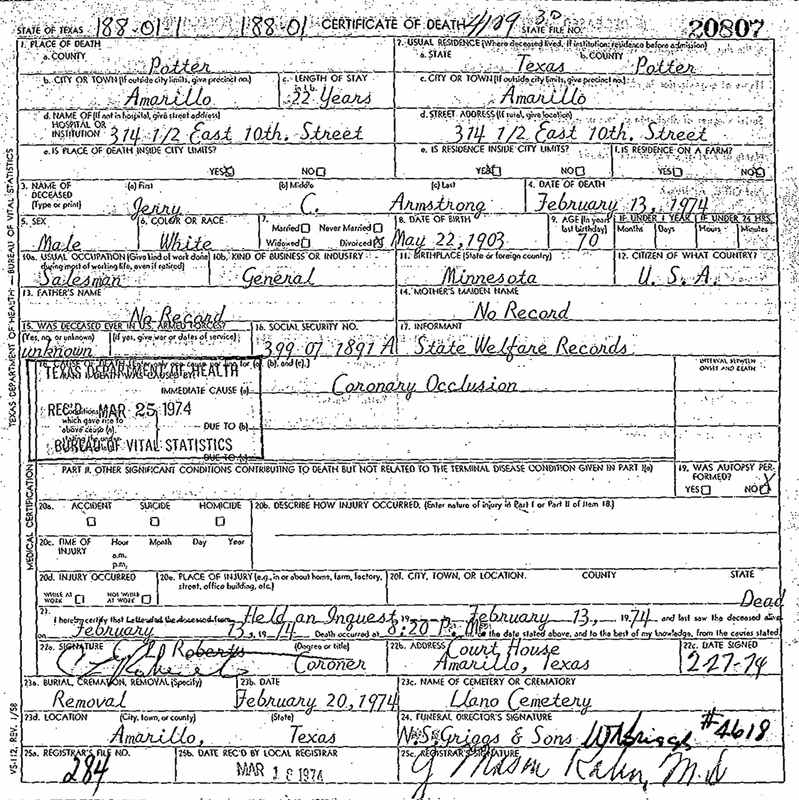 Blanche Alma (Mingori) Armstrong Death Certificate. The Morgan Heights Sanatorium was built in 1911 as the first tuberculosis sanatorium in the Upper Peninsula. The building was located in West Marquette County, near Ishpeming, Michigan. The name of the sanatorium was later changed to the "Acocks Medical Facility." The 1940 U. S. Census taken on April 19, 1940, shows Harry Armstrong (age 71) born in Wisconsin, and 5 years ago was living in the Same Place, and with 8 years of School, is a married Wood Products Laborer, and who is renting his home for $11/month and is living at 139 Fisher Street, 1st Ward, Marquette, Marquette Co., MI. Living with him is his wife, Florence Armstrong (age 58) born in Wisconsin, and 5 years ago was living in the Same Place, and with 6 years of School. The 1940 U. S. Census taken on April 20, 1940, shows Henry Setter (age 36) born in Michigan, and 5 years ago was living in Neenah, WI, and with 8 years of School, is a married Wood Turner of Wooden Ware, and who owns his home worth $400 and is living at 602 East 6th Street South, 6th Ward, City of Ladysmith, Rusk Co., WI. Living with him is his wife, Hazel Setter (age 30) born in Wisconsin, and 5 years ago was living in Neenah, WI, and with 2 years of High School. Sylvanous C. "Jerry" Armstrong moved to Texas about 1942. City police became suspicious early yesterday when they spotted a Bank of Douglas money pouch stuffed with what appeared to be money and coins. Patrolman George Lewis found the money bag in a car in which two men dozed peacefully at 4th Street and McDowell. John Maxwell Wallace, 34, of 3929 E. Devonshire, and Jerry C. Armstrong, 52, of 349 N. Third Ave., explained the sack and its contents, cut newspapers and metal washers, were used as props to sell insurance. Lewis said the men told him the money sack was used to arouse the curiosity of prospective customers "in order to get five minutes of their time." Both men paid $20 fines for being intoxicated after appearing before City Magistrate C. W. Pensinger. Florence Viola (Abbey) Armstrong died April 14, 1961, in Ladysmith, Rusk Co., WI, at age 79. Buried in Riverside Cemetery, Ladysmith, Rusk Co., WI. 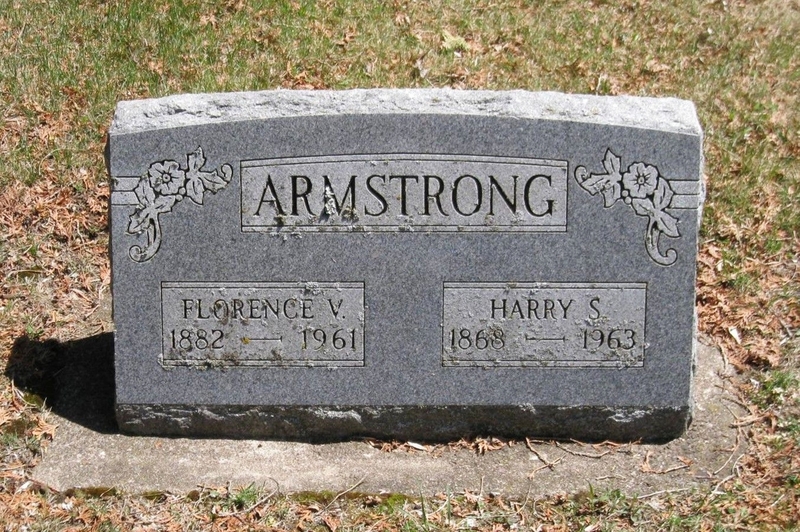 Harrison Sylvanous "Harry" Armstrong died April 25, 1963, in Ladysmith, Rusk Co., WI, at age 94. Buried in Riverside Cemetery, Ladysmith, Rusk Co., WI. Sylvanous C. "Jerry" Armstrong died February 13, 1974, at 314-1/2 East 10th Street, Amarillo, Potter Co., TX, at age 70. Buried in Llano Cemetery, Amarillo, Randall Co., TX. 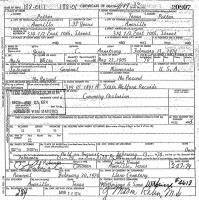 Sylvanous C. "Jerry" Armstrong Death Certificate. Jerry C. Armstrong, 314-1/2 E. 10th. Services pending. Jerry C. Armstrong, 314-1/2 E. 10th. Services were held 10:30 a.m. Graveside services Llano Cemetery, Wednesday.